Asset - the word used to indicate something of value to the bankruptcy estate. Most bankruptcy cases are "no asset" cases, meaning that there is no property of value that can be seized for the benefit of the creditors. An "asset case" refers to a case that does have something of value that is unprotected by existing exemption law. Automatic Stay - the legal protection that is automatically created when you file a bankruptcy petition. The automatic stay is what prohibits creditors from continuing any collection activity on a debt after you file a petition. 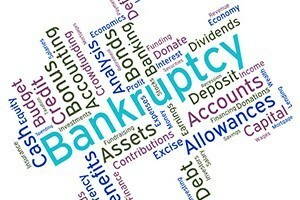 Bankruptcy - the legal process for eliminating, reorganizing and/or managing debt for individuals and businesses. Bankruptcy Petition - the legal document that opens a bankruptcy case. It is filed with the court and provides details about your debts, assets and an overview of your financial history. Creditor - the word used in reference to someone that is owed money in a bankruptcy case. Debtor - the word used in reference to the person filing the bankruptcy case. Discharge - the legal term used to indicate the elimination of your debts by the bankruptcy court. If your bankruptcy case is completed satisfactory, you will receive a "discharge of your debts" at the end of the case. The discharge means that you no longer owe the debts listed on your petition. Creditors cannot attempt to collect on any of the debts that are discharged in bankruptcy. Dismissal - the legal term used when your case is terminated by the bankruptcy court without a discharge. If you receive a bankruptcy dismissal, your debts are not released and you are still liable for them. They have not been eliminated. If you receive a bankruptcy dismissal, your creditors can begin their collection efforts again. Exemption - legal protection of an asset from seizure or liquidation by creditors. Many of your assets are protected from liquidation during bankruptcy, including your house. Florida has exemption laws in place for majority of assets that most people have (401K's, homestead property, personal property, cars, wages, etc). Some of these exemptions are limited and some are unlimited. A bankruptcy attorney can help you understand the differences. Means Test - a "test" that determines your eligibility for a Chapter 7 or Chapter 13 bankruptcy. If your income is above a specified amount you may not qualify for Chapter 7 bankruptcy protection. In the cases where you do not qualify for a Chapter 7 (debt elimination without repayment), the Means Test may determine how much your monthly payment will be under a Chapter 13 reorganization plan. Motion - a document that is asking the court to do something. Motions are the formal process that either creditors or debtors (those filing for bankruptcy) use to ask the judge for an order directing someone to do something. Secured debt - a debt that is secured by property. If you fail to make the loan payment, the creditor has the right to take the asset in order to satisfy the debt owed. Mortgage loans and car loans are the most common examples of secured debts. Trustee - the court appointed representative that is tasked with reviewing your bankruptcy petition and ensuring that your case is administered properly. The trustee is responsible for identifying unprotected assets (if any), collecting and distributing the assets (if applicable), declaring when there are no assets to distribute and reporting all findings to the court. In Chapter 13 plans, the trustee is also responsible for administering the repayment plans. Unsecured debt - a debt that is not secured by property. They are called "unsecured" because the creditor has no right to your assets if you fail to make the loan payment. Credit cards, medical bills, some personal loans, and utility bills are examples of unsecured debts.